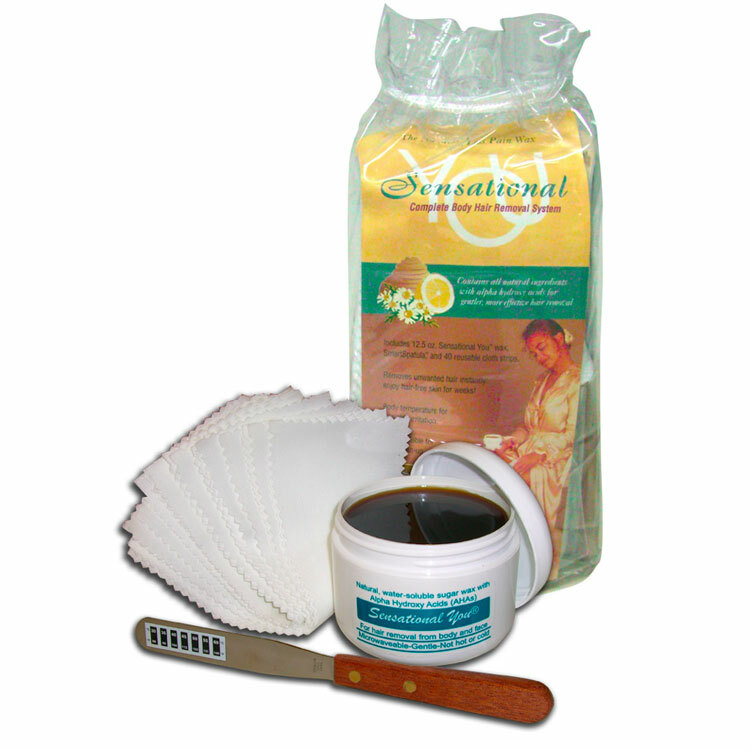 Sensational You complete waxing hair removal set. Enough to do 3 or more full legs plus bikini waxings. One jar of wax, 40 reusable waxing strips and one SmartSpatula with temperature indicators. All-Natural Ingredients:Contains more than 20% real bee honey, as well as sugar, chamomile tea and fruit acids (alpha hydroxy acids). Leaves the skin super smooth! Body Temperature Wax:Can be used at or just above body temperature, which feels pleasant on the skin. Use SmartSpatula to eliminate the guesswork, it tells you the temperature of the wax. Easy Cleanup:Sensational You is water soluble, making cleanup a breeze. Just wipe if off with moist towel (warm water works best). MORE INFORMATION:Click here for more information! Hair to be removed must be at least 1/8", preferably 1/4" (one quarter inch= 6 mm long). If shorter, wait a few days longer (best results are obtained letting the hair grow for 2-3 weeks). See bottom of waxing instructions for dealing with facial hair. Wax, cloth strips (3" by 9" for body), spatula (best is SmartSpatula® with temperature indicators), moist small towel. The SENSATIONAL YOU® Starter Kit has everything you need for professional waxing results at home. Wash area of hair removal with soap and water and dry well before starting. Any lotions or makeup on the skin may prevent the wax from removing the hair. The wax can be used at room temperature, without heating it, or heated a few seconds in the microwave to make it easier to apply. To heat it: Remove the cap and disk and place jar in microwave oven. Heat on full power for 20-30 seconds. If cap is hard to remove, heat the closed jar 5-10 seconds, then it should come off easily. Microwave ovens vary, so heating time must be determined for your unit!!! Stir well with spatula or use SmartSpatula®. The wax should be soft but not runny. Test on a small area to be sure it is not too hot. The ideal temperature for application is 30-40 degrees Celsius (86-104 degrees Fahrenheit). 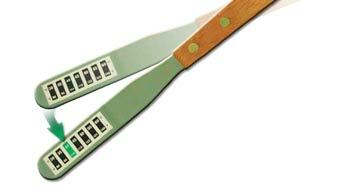 SmartSpatula® indicators change from black to green to show the temperature the wax is at. If necessary to reheat wax, place in microwave for only 15 seconds and test as before. Apply a very thin layer of the hair remover in the direction of hair growth. Smooth a cloth strip on top of the wax. Remove strip with a very rapid motion against the direction of hair growth, while keeping the skin taut with the other hand. Always pull as close to the skin as possible . If strip is peeled off too slowly, wax will remain on skin and hair will not come off. IMMEDIATELY AFTER WAXING: Wash area with moist towel to remove any excess wax. Temporary redness in the waxed area is normal. Applying an ice bag to the area immediately after cleaning reduces redness and irritation. Avoid exposure of waxed skin to the sun for 12 hours. Use Quench PT post-treatment balm on the area to soothe the skin. In areas prone to ingrown hairs, such as the bikini, underarms, or in men's beard, apply BUMP AND BLEMISH® immediately after waxing, and after it has absorbed into the skin, apply QUENCH PT® to deeply moisturize. Avoid using make-up and other skin products for a few hours after waxing. In areas prone to ingrown hairs, continue using BUMP AND BLEMISH® twice daily to keep the skin clear. Use QUENCH PT® as a soothing moisturizer, after BUMP AND BLEMISH® has been absorbed by the skin. SENSATIONAL YOU® is a very gentle wax that can be used on body and face. Hair in the upper lip and eyebrows can be difficult to remove because it is harder to keep the skin very tight and to pull effectively. Try using the wax at a lower temperature (or do not heat it at all). Cut the strips to approx 3x1 inch. Use your other hand to keep the skin very tight. Do very small areas at a time. Spread the wax very thin. Repeat procedure if necessary. Clean the area and apply ice to reduce irritation and swelling. QUENCH PT® is great to soothe the skin after waxing.